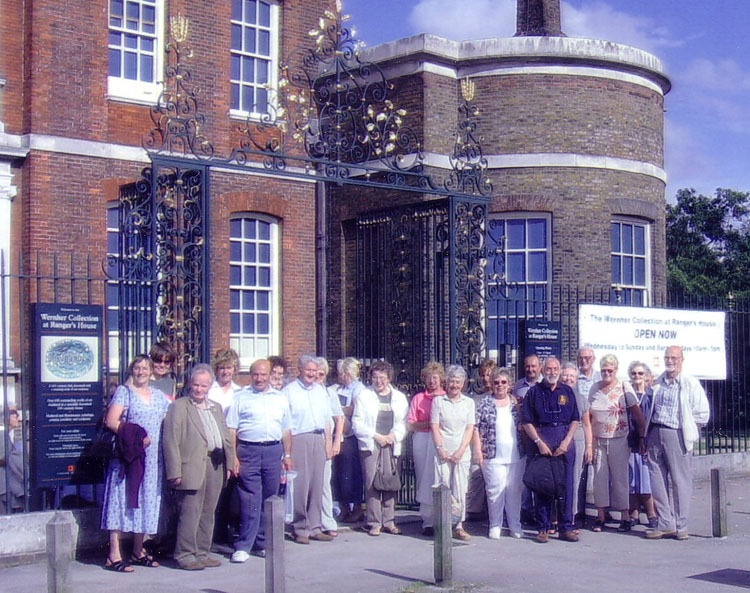 Members and friends enjoyed a very interesting coach trip, on a beautiful sunny day, to Eltham Palace in south-east London and the Rangers House in Greenwich. Eltham Palace is a mixture of ancient and modern. Originally a medieval palace, built in the 15th century, of which only the Great Hall remains. Henry VIII lived in the palace as a child. The palace was bought by Stephen and Virginia Courtauld who had an extension built decorated in the Art Deco style. It was completed in 1936 and incorporated all the most modern inventions for comfortable living including under-floor heating. The Rangers House, an 18th century villa, at Greenwich is a cornucopia of medieval and Renaissance works of art collected by Sir Julius Wernher (1850-1912). The Wernher wealth came from the diamond mines of South Africa and enabled Sir Julius to buy exquisite items that appealed to him but were not necessarily fashionable at the time, although these days they are priceless. Both houses are in the care of English Heritage. After the tours there was time to sit in the rose garden or stroll in Greenwich Park. Some members also visited the Observatory or the museum.